Got a cat, dog, or horse? 1800petmeds.com is a great source for online medication. Recently, one of our team members had to buy a prescription for their cat Jake. 1800petmeds.com fully met their expectations (bonus: Jake got free catnip), but they also did something really interesting that most e-commerce vendors don’t do. They sent a direct mail letter in addition to their regular emails. Throwback or what? The most effective e-commerce marketing programs use email as a core tactic for conversion and retention, but snail mail is frequently ignored. Once thought to be archaic, direct mail marketing is making a comeback. 1800petmeds does a great job of blending both online and offline tactics. Nowadays, everyone is so inundated with spam, that email promotions often get ignored or deleted. 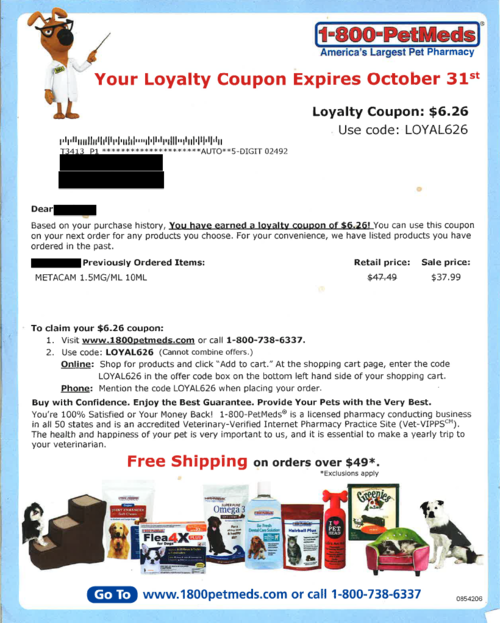 1800petmeds.com’s marketing program works because they send coupons by both email and direct mail. All in all an excellent execution. 1800Petmeds.com is a perfect example of why thinking outside the inbox is so important to generating e-commerce revenues. So, don’t just think about communicating with emails. Everyone gets so many. Break out of the inbox. Try the litterbox mailbox. Email needs to be an important part of every e-commerce site’s conversion and retention tactics, but don’t overlook direct mail offers and promotions. They can be very effective. Need help developing on-line/off-line conversion and retention programs? Let’s chat.